Media of instruction may value the other culture to the detriment of the local culture and develop identification processes that have consequences on various stakeholders in terms of cultural and identity capital. 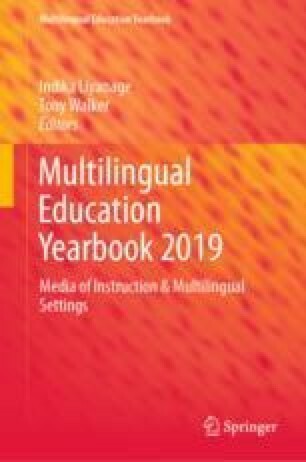 This comparative and international Education study focuses on three cases that illustrate how multilingual settings impacted the sense of identity of language teachers in Asian contexts. It also explores how phenomena such as cultural inclusion, immersion, and the transcultural are enmeshed in the creation of global identities. They may create a split between the first language and culture and global culture. Internationalization has a deep effect on people of the upper middle class who tend to situate their sense of belonging in an imaginary that projects their future outside their country. The emphasis on English as the world dominant language tends even to modify local identities and places the source of economic attraction, pride and the sense of worth outside the Nation-State. The exception may be in bilingual settings where both linguacultures are welcome and respected, taught, and integrated. This study was sponsored by the School of Education of the University of Wisconsin-Madison through a sabbatical study leave of absence. Professor Tochon is President of Deep University International, a Section 509(a)(2) Charity and Chairman of the Deep Institute, Wisconsin. De Costa, P. (2018). A better way forward for transnational higher education. University World News, 512, July. Retrieved from http://www.universityworldnews.com/article.php?story=20180626103409378. Feldman, A. (1999). Conversation as methodology in collaborative action research. Amherst, MA: School of Education, University of Massachusetts. http://people.umass.edu/~afeldman/ActionResearchPapers/Feldman1999.PDF. Olson, E. T. (2010). Personal identity. In Stanford encyclopedia of philosophy. Retrieved from http://plato.stanford.edu/archives/win2010/entries/identity-personal.